We shared the following video in assembly on Friday. 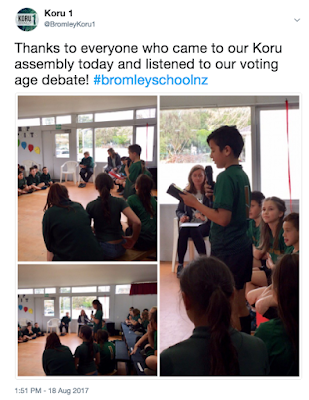 It was great being able to communicate with all of our Koru team, teachers and parents about how we are building our understanding on lots of things related to a general election. After sharing this video, Mana, Lilly, Zavier and Kaizen courageously shared their arguments for what the voting age should be. We had all of the audience vote for who they agreed with on the way out at the end of assembly. After counting the votes, we will announce the debate results soon. The students who shared their arguments received great feedback from teachers and parents! They can be very proud of themselves. This week we will be exploring what we already know about how elections actually work and what we still need to find out.